What to consider when designing and building in snow-prone areas. While properly-designed metal roofs historically perform well in winter, heavy snowfall can be detrimental to buildings of all kinds. Those who live and work in and around them are also at risk when snow and ice cause dangerous situations. Even though winter doesn’t formally begin until late December, colder weather is upon us. And while you might not be expecting snow or ice yet, keep these roofing and snow tips in mind when designing, constructing and maintaining structures in areas where there’s a chance for snow and/or ice over the course of the year. Snow accumulates on every roof type, and as this happens, it increases the amount of weight your structure is bearing. This increased weight (snow load) can pose several threats to the structure and those in and around it. For example, when the weight of snow or ponded water from melted snow exceeds the structure’s limits, the roof or even the entire structure can collapse. Be sure you’re aware of the weight your structure can bear and remove snow to keep it within its limits. Consult the International Building Code (IBC) as well as state and local codes for guidance based on your location. Most ice dams are the result of air barrier flaws in buildings. If warm indoor air escapes through the roof floor, it warms the roof sheathing and melts the underside of the layer of snow on top. This water then moves down the slope of the roof toward the eaves, where it freezes into ice. As this process continues, the ice gets thicker and thicker, resulting in ice dams. The presence of these dams allow water to back up and form a reservoir that can cause major damage. Another tip is to use a peel and stick membrane on the roof deck extending from the eave to about 3’ up-slope from the exterior wall. For more specific details on the ice dam prevention tips above, read our recent blog post. Gravity can cause accumulated snow to slide down the roof’s slope (shedding), potentially injuring people and damaging property below. Despite this, snow shedding must occur to keep the snow load from accumulating beyond the buildings structural limits. Balancing snow load and shedding is important and requires that you consider geographical and building material and roof design factors. Ice and snow sliding down the main roof has damaged the roof panels and the valley trim on this connector roof. Roof slopes of 45 degrees (12:12) or more, can accelerate sliding snow with sometimes immense and dangerous consequences. For example, if snow accumulates and then falls onto an exterior gas line, pipes could rupture. From there, the smallest of ignition sources could set the structure ablaze. In addition, the weight of sliding snow can propel any icicles formed on eaves can be propelled down by the force and weight of sliding snow onto people and property below. On slopes less than 45 degrees (6:12 to 9:12), low amounts of friction (like on smooth roof surfaces) means it offers less resistance to sliding. 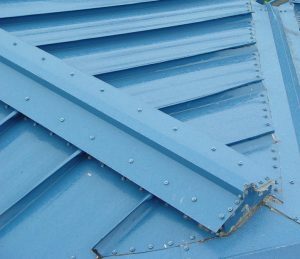 Striations and embossing on roofing materials like metal panels add a small 3D profile and improve the resistance to sliding, especially when they run traverse to the slope. This can get complicated, but in general, installing metal panels with snow retention devices on a steeply-sloped roof is recommended. This approach will naturally shed snow and ice, and protect your structure from excessive snow loads. If you have a low-sloped roof, be sure it’s design supports snow as shedding won’t occur naturally. Including enough snow retention devices from ridge to eave is also imperative for this design. A variety of retention options, such as snow fences, bars or guards, are designed to make snow and ice melt completely or fall from roofs in small amounts. 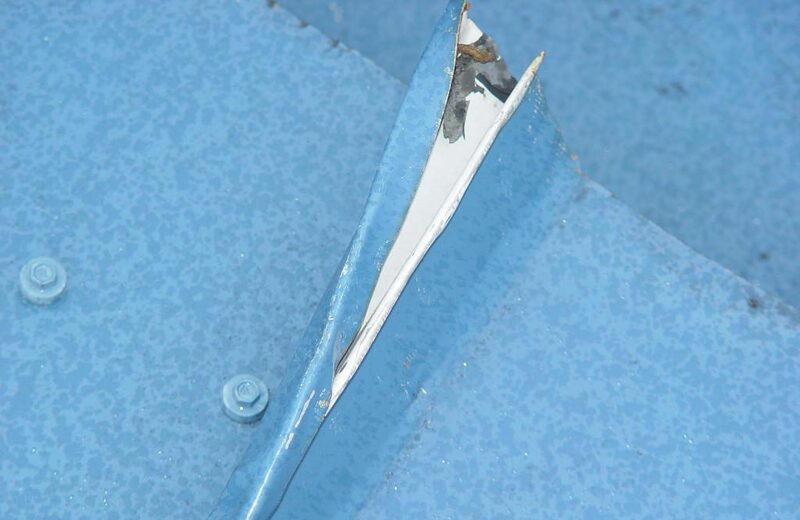 This helps reduce risks associated with sudden rooftop avalanches while maintaining the clean lines of the roof. It is important that snow retention systems are carefully engineered and properly installed. Models like S-5!’s snow-retention device design resource allow you to input your roof dimensions and expected snow load to adequately engineer snow fence assemblies. This pipe penetration is protected from sliding ice and snow by a small section of S-5! ColorGuard to the panel seams immediately up-slope from the pipe. The weight of sliding snow can be powerful enough to take off attachments like exhaust vents. 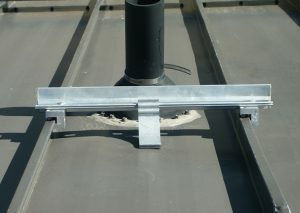 To combat this, reduce the shear load by installing rigid vent pipes securely and as high up on the roof slope as possible. If this is not possible, protect the pipes with a snow retention system. While metal roofing responds well to harsh winter weather, it is imperative to take the time to keep snow, ice and moisture from causing issues. No matter the roofing design or material used, keeping people and property safe from overhead dangers should be a priority when designing, installing and maintain your structure. In part two of this roofing and snow series, we’ll review additional considerations. It contains tips on roof layout, color, weathertightness and maintenance, which also play important roles in winter weather protection. For more information on roofing and snow like how metal panels fare in winter weather conditions and for advice on how to winter-proof your roof, reach out to an ABC representative today.